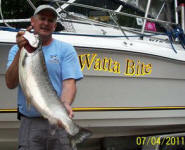 Jim Dexter, Chief of Fisheries for the State of Michigan, ventured out with Captain Bill. It was cold, snowy and the fishing was excellent. Jim is a hands on guy, not afraid of a little cold. He caught his first fish within a couple of minutes of letting his line down. Not bad for never fishing Cisco before. These little white fish all range between 2 and 3 lbs. They are awesome to catch on an ultralight. Thanks Jim for taking time out of your busy schedule, to do a little fishing.